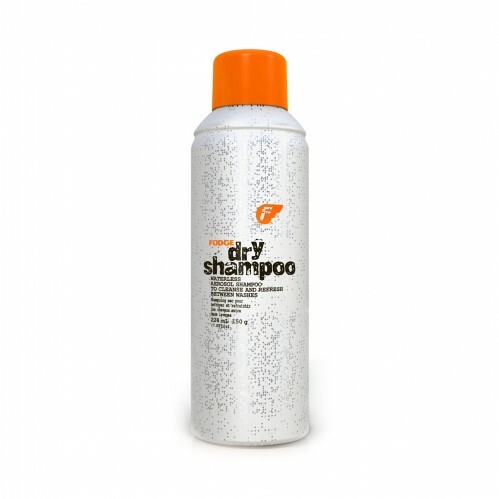 Fudge Dry Shampoo 150g gives an instant, effective dry clean between washes. Whether you're late for work, glamping at a festival or going from beach to bar, the new Fudge Dry Shampoo is a haircare essential. Simple shake and spritz for ready-to-style hair in an instant. Voila! Perfect for every hair colour, ideal for every situation. Our team really love this incredibly versatile product. Fudge's special formula includes rice starch to absorb oil, apricot kernel oil to smooth and unique transparent dust technology for clean, fresh results that keep your hair-washing secrets.